The speakeasy, a Prohibition staple, brings with it images of intrigue, illicit thrills, and the intermingling of the classy and debonair. Just because Prohibition's gone, that doesn't mean that the speakeasy went with it. Put on your sharp clothes and get ready for a wild night out at 10 great Michigan speakeasy bars! Even just finding the Traverse City Speakeasy is a bit of a challenge. Looking for a building with an unusual symbol on it on West Front Street helps you find the place, and before you even go, reports suggest you'll need to hit the website and get a unique password, generated on the site. You'll need to present said password to the bouncer at the door in order to get in. There's no word about what's on their menu, whether they've got food or not, which makes this effectively a full-on speakeasy in a country where alcohol is legal. With locations in Ann Arbor, Detroit and Las Vegas, La Casa is one of the premier cigar lounges the state can offer. But what's a little lesser-known is that the cigar lounge is the lower level. The upper level, meanwhile, is where the cocktails and couches come out to play. Slip into the upper level of a La Casa and you've found a real home, complete with jazz, special events, and even membership, though that much is optional. Fenton's Relief and Resource is a speakeasy that goes about as far as a speakeasy can while still keeping itself quiet. Home to not only beer and wine, but also whiskey, highballs, cocktails, various punch and even non-alcoholic drinks, if it's liquid, it's pretty much here. But the Relief and Resource doesn't stop there—it's also got a full menu from marinated olives to a charcuterie board, and even some desserts to round it out. Grand Rapids' SpeakEZ Lounge looks to be “old school without pretense,” and invites patrons to “celebrate like it's 1933.” Handy, as that was the last year of Prohibition. Anyway, those coming in will be able to get access to liquor on par with 1933, starting with 12 craft beer options—all on tap—wines by the glass, a reserve bottle list, and a complete Signature Cocktail menu. Throw in special events and a food menu that starts with “Bahn Mi Jackfruit Sliders” and you've got all you need for one wild night. Head on out to Howell for a speakeasy-style experience. The style is certainly worth noting on its own, but it's everything else that makes this one to check out. Start with small plate food and segue into martinis and other classic cocktails as well as Michigan craft beers—and you know we've got plenty of those out here—and you'll have just about anything you could ask for. Kalamazoo's the Gatsby looks to intermingle the traditional speakeasy with all the modern fixtures to create a noteworthy experience. Start with the latest in music in a speakeasy-style establishment and the most classic of cocktail recipes—start out with an Old Fashioned and segue into a Tom Collins, along with several breeds of martini—to create the full package. Even the name, with its classic literary roots about a wild Prohibition-era millionaire, creates the image of speakeasy well. Muskegon's 18th Amendment Distillery looks to provide that old-fashioned speakeasy feel by focusing on the lawless nature of the older distillery. It offers membership in what it calls the “Scofflaw Society,” a memorial to those who” stood up against an unjust and immoral law,” by which it means Prohibition. With benefits ranging from daily drink discounts to a personal aging barrel for those in the Elite 33 branch, there's a lot to offer here. 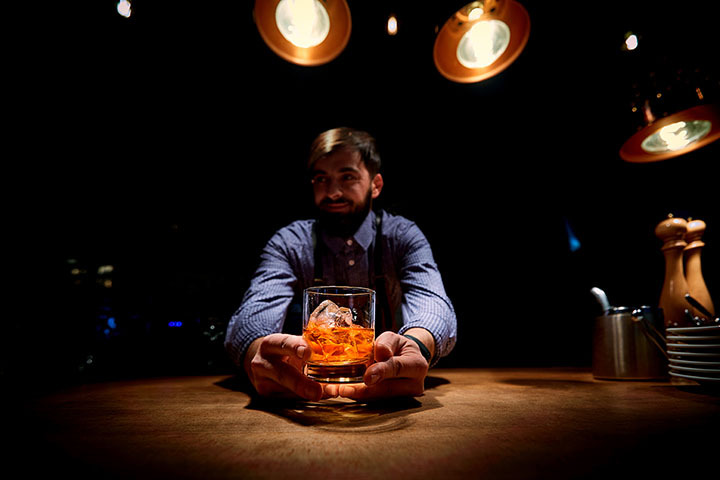 Plus, the distiller offers up its own branded rye and bourbon whiskey along with a slate of cocktails and a menu of foods ranging from snacks to sandwiches to full wood-fired pizzas. Jackson's Roadhouse is a bit of a special case. It isn't a speakeasy today, but it was a speakeasy, reports note, back in the days of Prohibition. This status actually carries on to this day, as the building is believed to be haunted by several spirits. One patron, a mobster by profession, was shot therein and buried in the basement, and when a psychic came out to investigate, said psychic became “too overwhelmed by some kind of presence” and evacuated the building. For those who can stand the ghosts, you can get your now-thoroughly-legal booze over the spirits therein. It's time to go back to Detroit for a place that's part speakeasy today and part speakeasy yesterday. While Tommy's has that kind of speakeasy-style feeling to it, it's Tommy's past that's particularly interesting here. An expedition by Wayne State University archeologists found that Tommy's basement was previously home to Little Harry's Speakeasy, said to be controlled by the Purple Gang. While there aren't any ghosts to speak of, it's still a connection to Michigan's own Prohibition past. Finally, we head back to Ann Arbor for a look at Babs' Underground, a location called “one of Ann Arbor's best-kept secrets.” Babs' Underground not only goes for the speakeasy spirit, but it also incorporates modern touches like pool tables, arcade games, and even plenty of large televisions to catch the latest game. There's even a vintage photo booth for good measure, which lets it take bits and pieces from every part of history since the Prohibition ended.